We decided to research the construction and impact of 95 through Hopkinton and Richmond. Two years later we each made a presentation of our research in the form of slide presentations. What follows is a condensation of those 2 presentations. 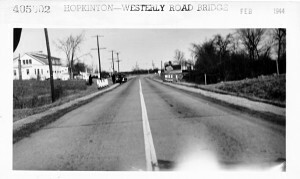 The first section focuses on Hopkinton; the second on Richmond. 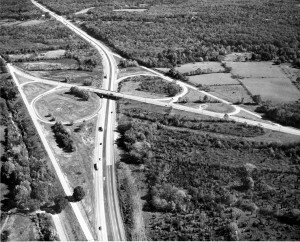 Before we explore the construction and impact issues regarding I-95, let’s look briefly at the history that made the “Superhighway” necessary. That history goes back to the opening of the New London Turnpike in 1817. It was a toll road and the shortest distance between New London and Providence. The angle at which the turnpike cut across Hopkinton is approximately the same as the angle at which 95 cuts across the town today. 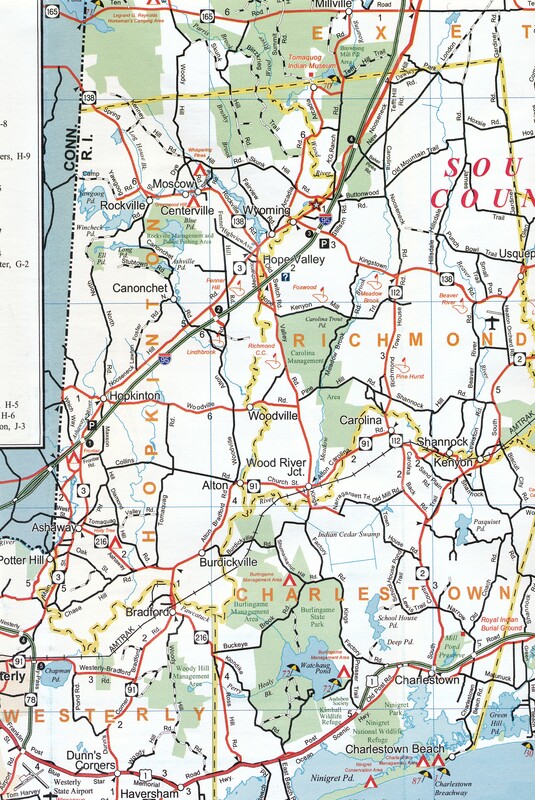 On the map “Hopkinton City” is written in large print. This village was an important stop on the turnpike. Ten or 12 stagecoaches each day stopped in here for fresh teams of horses. Each coach carried about 10 passengers, needing rest, refreshment and perhaps an over-night stay. However, the turnpike’s days were numbered. The steamboat route printed along the coast on the map. Steamboats were carrying dozens of passengers per voyage between New York and Providence in under 20 hours. Competition increased in 1836, when the Providence – Stonington Railroad opened. Ten or even as many as fifteen passengers could squeeze into a stagecoach. 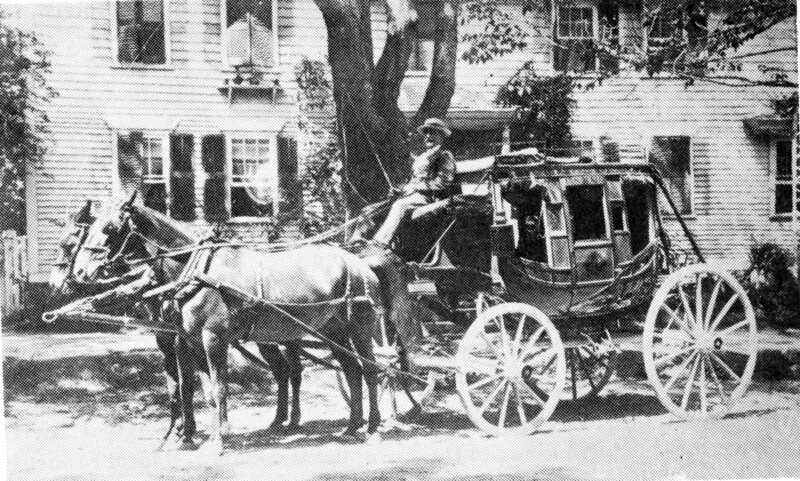 Coaches traveled at only 5 to 10 mph and frequently had to stop to pay tolls or to change horses. Travel by stage was slow, inefficient and uncomfortable. 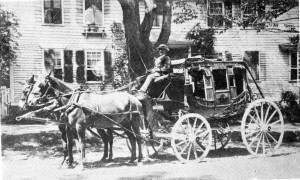 By the 1870’s few if any stagecoaches were seen on the turnpike. increasing number of early autos. 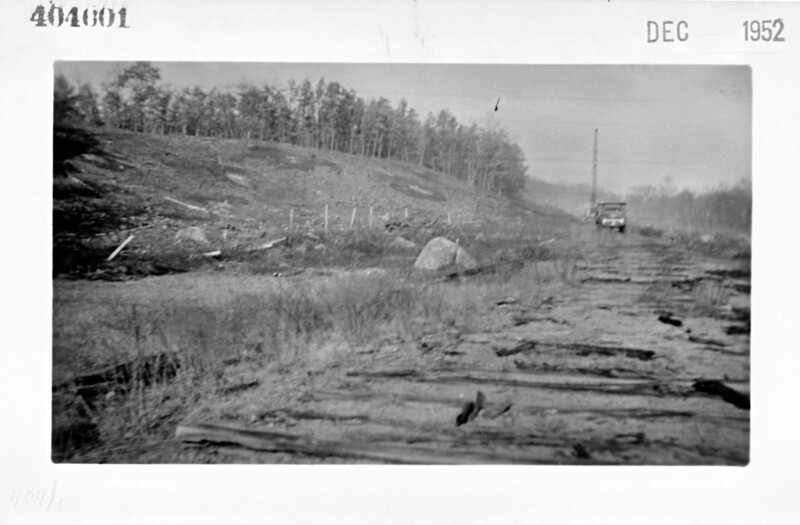 Around 1925 the old turnpike was widened (somewhat) and paved. The paved surface kept cars from getting stuck in mud and allowed them to go faster. Still it was quite narrow and was hilly and winding in many places. Traveling the turnpike by car was becoming dangerous. In fact the stretch of highway between Wyoming & the state line was reportedly the most dangerous in Rhode Island. George Reynolds said that Brightman Hill, just south of his farm, was the scene of a number of serious accidents. 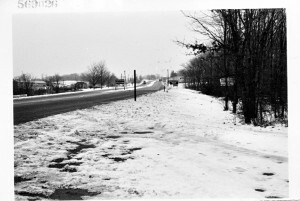 Winter ice and snow often caused trailer trucks to jack-knife. Accidents here could kill and stop traffic for hours in both directions. 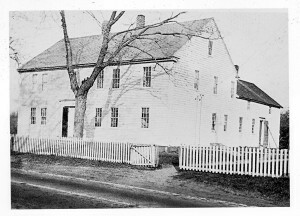 The General Thurston Mansion pictured here was built about 1773. It and other buildings in Hopkinton City were placed very close to the highway. In colonial times, when travel was by foot or horse, this was really handy. However, it created a bottle neck for 20th century traffic. By the 1840’s Hope Valley had grown into an important industrial village, but its buildings were still quite close to the old turnpike. 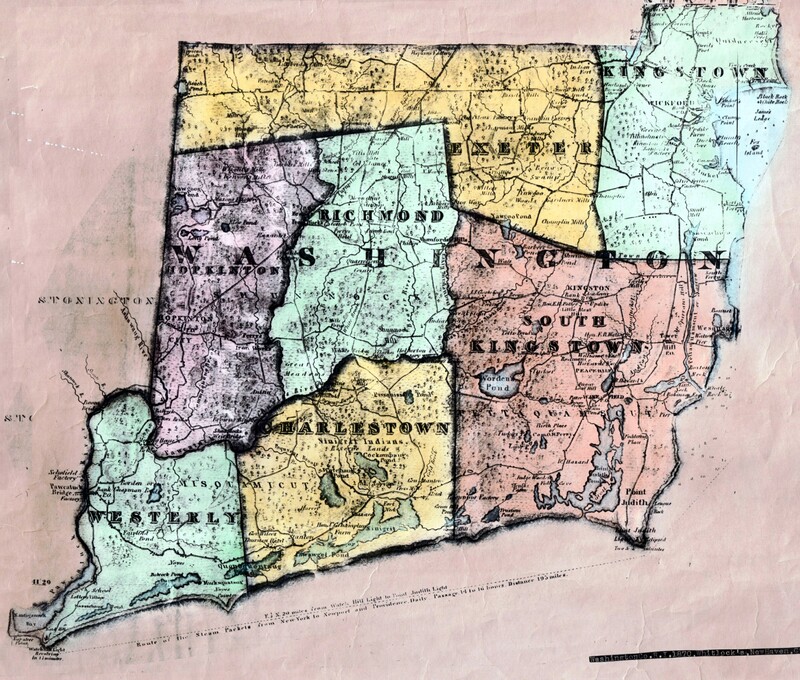 However, by the 1930’s it had been designated as Rhode Island Route. 3 and carrying both local and long distance traffic. 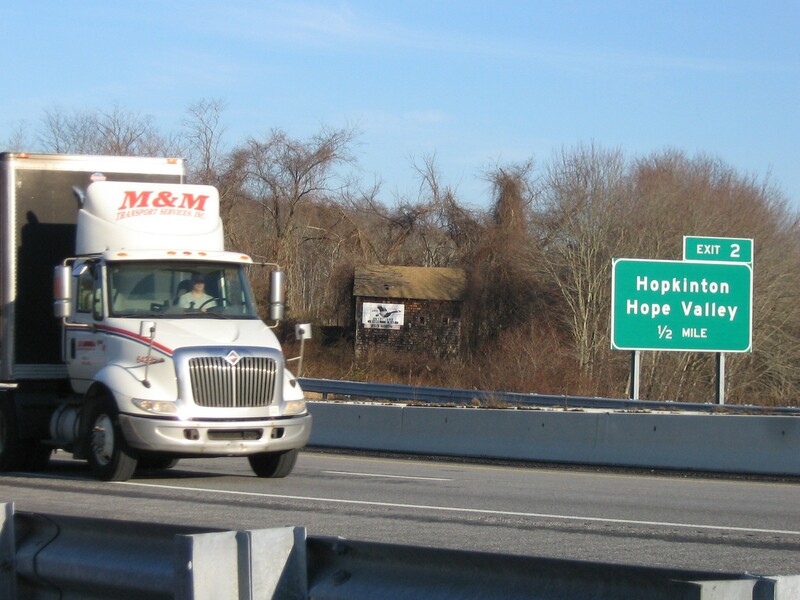 Fred Kenney, now 92, recalls lines of trailer trucks passing through Hope Valley day and night in the 1940’s & ’50’s. At the time he was raising a family right across from Ma & Pa’s Market on Main Street. Traffic had to go slow because it was and is a school zone. At times the noise and fumes were nearly unbearable. 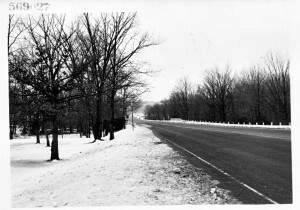 This photo was taken near a place called the “Triangle”, where the old New London Turnpike split off from Rte. 3. 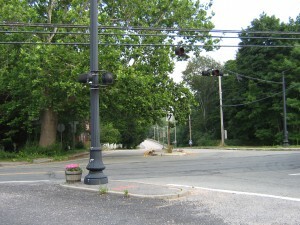 At this triangular intersection the turnpike headed down into Connecticut, while Rte. 3 continued into Ashaway. Here highway engineers are looking over the location where a new intersection will be built for a new “Superhighway”. The new highway be will be an alternative to Rte. 3 across Hopkinton and Richmond. However, it also will take traffic into Connecticut, just as the old New London Turnpike had. The new intersection will allow Rte. 3 (AKA Main Street) to pass over the new highway and safely into Ashaway. 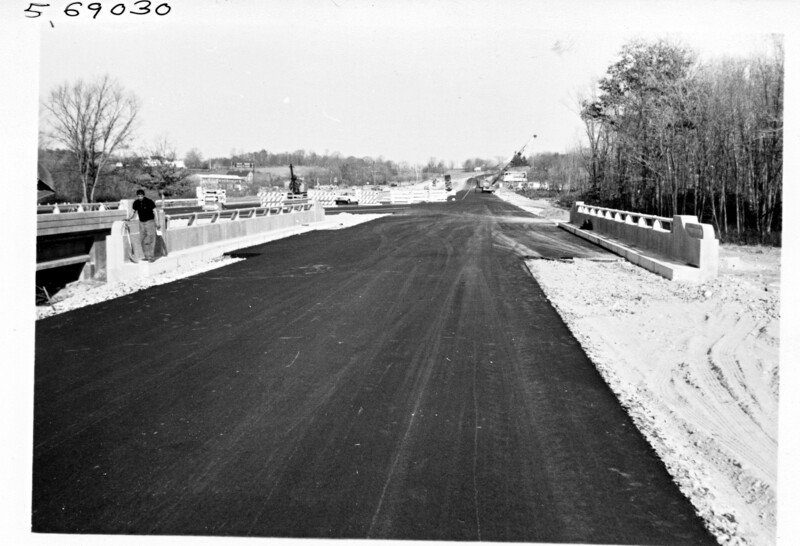 This new “Superhighway” will be completed in 1955 and will be known as Rhode Island Rte. 95. It won’t gain Interstate status until 1969! 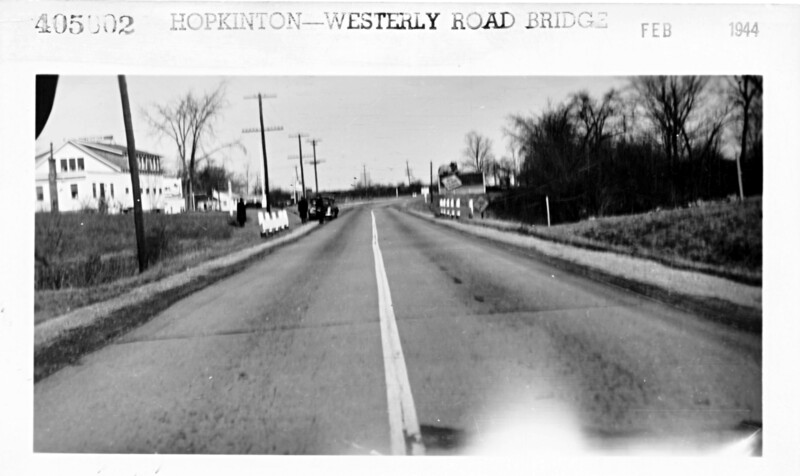 The new intersection will be called the “Hopkinton Interchange”. We know it today as Exit #1 on Interstate – 95. Here Rte. 3 is in red and its replacement, now Interstate-95, in green. 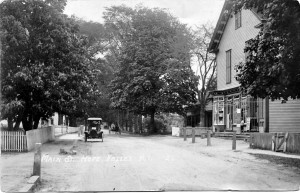 By diverting long distance traffic, it left Hopkinton City and Hope Valley as quiet backwater villages, almost time capsules of earlier times. However, the construction did have a great negative impact on some locations. 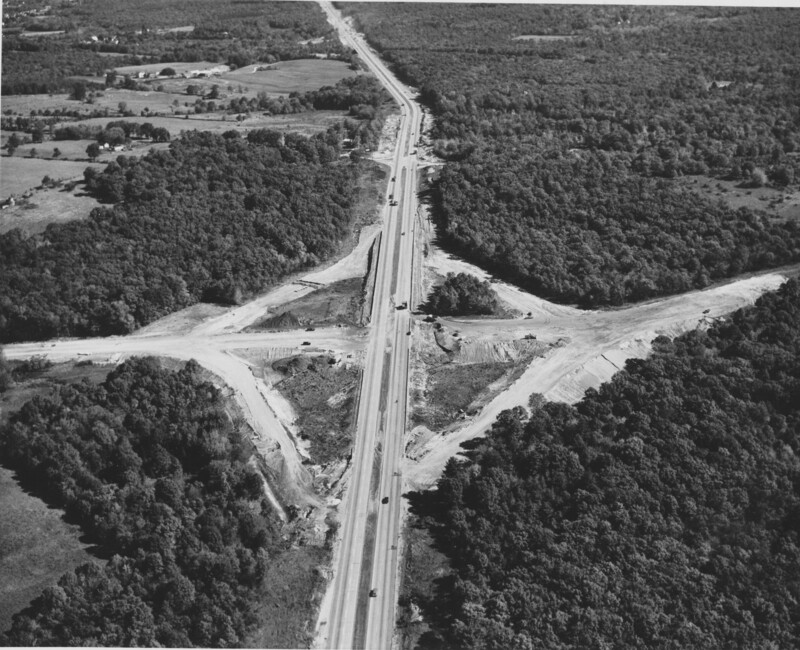 The first 95 construction in Hopkinton began at what will become Exit #1. 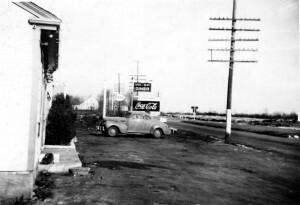 Since the 1930’s the area had been known as the “Triangle” named for the triangular shape of the intersection, where the New London Turnpike went down to CT. and Rt. 3 went left to Ashaway and Westerly. Once completed, the construction seen in this aerial photo will take Rt. 3 traffic safely over 95. However, it will obliterate most of the historic buildings and features in the immediate area, as will be seen in the following series of photographs. The only building to survive the construction was once a dance hall. Because of its location, it too was called the “Triangle”. 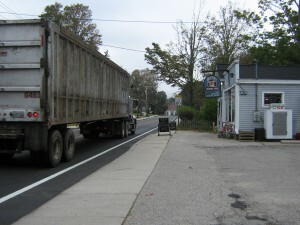 It was moved a mile or so south to Ashaway and today it is a private home at 256 Main St. 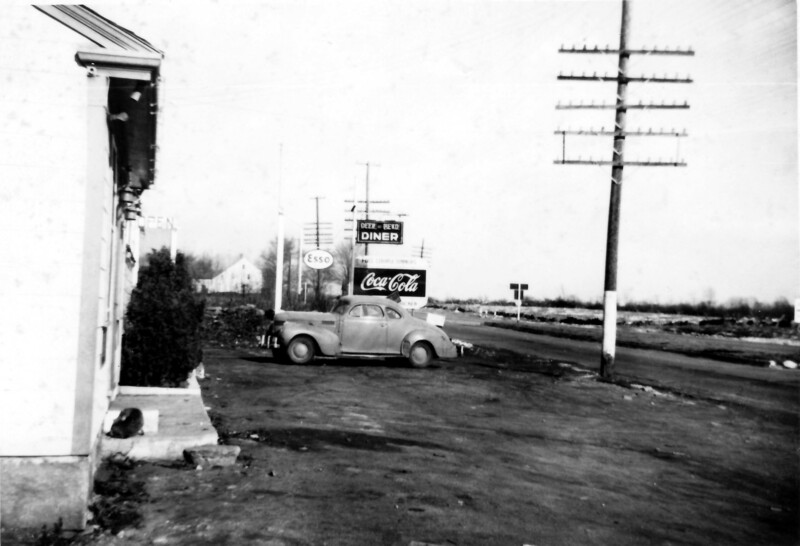 The Deer Head Diner and the Esso Station were a highway staples – fast food & fast fuel. 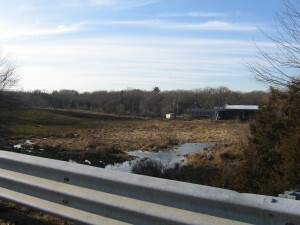 The Hopkinton “Town Farm” can be seen in the background. All three were located near the point of the “Triangle” intersection. All three were demolished during the construction of the “Hopkinton Interchange” (AKA Exit #1). 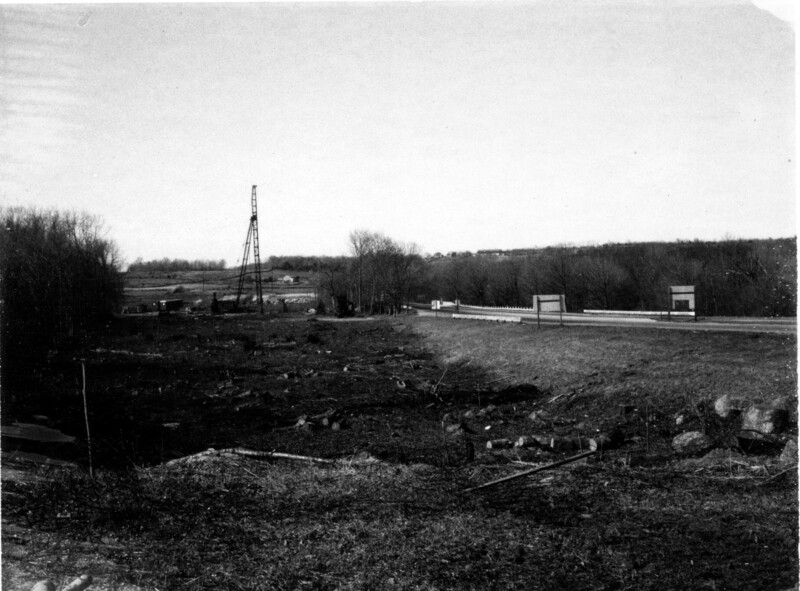 Here Hopkinton’s “Town Farm” is viewed from where the Exit #1 park & ride is today. 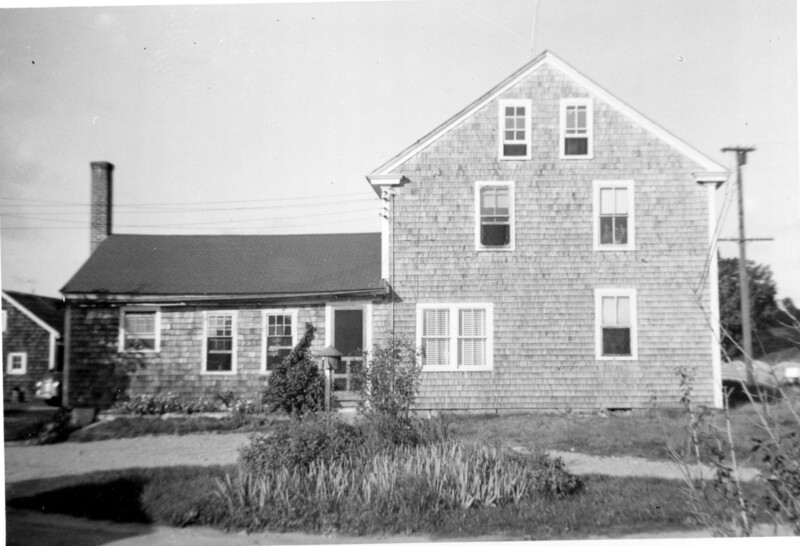 The farm served as Hopkinton’s “poor farm” for nearly 100 years. It provided a safety net for the towns’ elderly and infirm, who had no one to support or care for them. 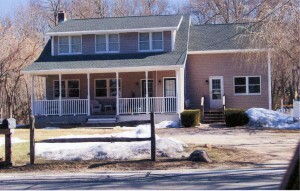 The “Town Farm” residence was directly across from the park & ride entrance. American Keunhe in the background of the slide is located in what was once the farm’s small orchard. 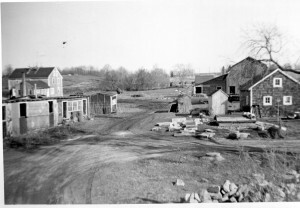 The rest of the farm – barns, pastures, hay fields, and a burial lot for deceased residents – were located on the park and ride side of Main Street. Parts of the foundations of the house and of the barn, as well as stone walls for the fields can still be found. 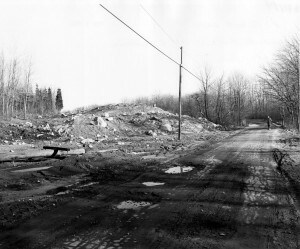 The burial lot, listed as Hopkinton Historical Cemetery #80 cannot be seen today. It was buried under tons of construction debris in 1969/70. 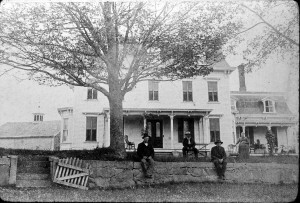 This farmhouse also doesn’t appear on the aerial photo, but was located a little south of the old “Triangle” dance hall. To the left of the large evergreen the Exit #1 overpass in the background to this nearly complete. 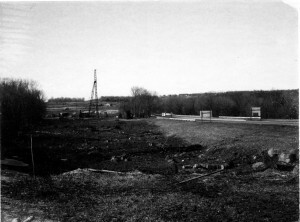 To the left of the overpass there is a large rectangular billboard placed to be seen by traffic coming up from Conn. on the old turnpike. To the left of the billboard a small piece the turnpike can be seen. These items can be used as land marks in later aerial photos. 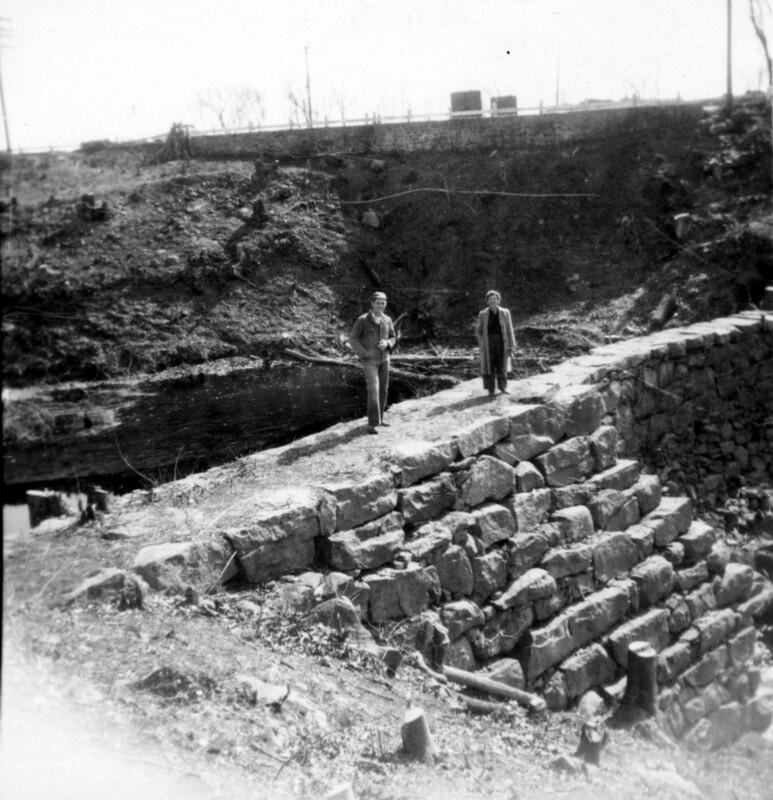 Chester’s Dam impounded water that powered a woolen mill in the mid-1850’s. It also supplied ice that was stored in an ice house nearby. The area of the dam is significantly wide and deep as can be seen in comparison to the people. The people are Donna James and her son, Edwin Jr. We’ll hear the James Family’s story soon. 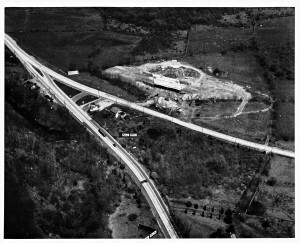 To accommodate the construction of the Exit #1’s southbound cloverleaf the ledges above Palmeter’s Brook were blasted and the brook moved a number of yards to the left. 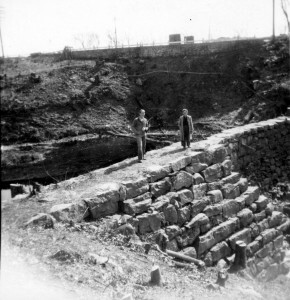 Chester’s Dam, as well as the nearby ruins of the woolen mill and the ice house were covered with tons of fill. The shape of the intersection that gave the area its name. To the right of Rte. 3 coming from Ashaway, construction has begun on the “Hopkinton Interchange”. Before merging with Rte. 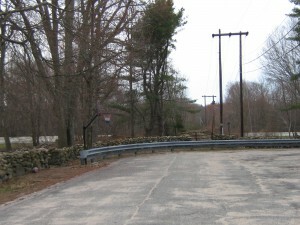 3.the old turnpike curves coming up from Conn. to avoid the steep drop to Chester’s Dam. 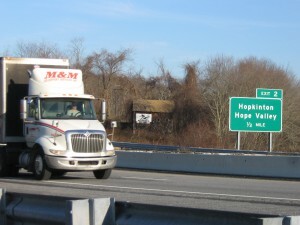 The billboard to the right of that curve is placed to be in the sightline of the northbound lane of the turnpike. 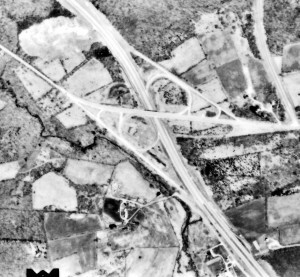 “Ghosts” of the old roadbeds can still be seen in 1968. 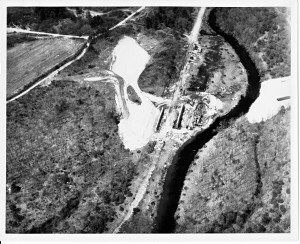 The “ghosts” of the old turnpike curving to avoid the drop to Chester’s Dam and the piece of Rt. 3 that was replace by the overpass. 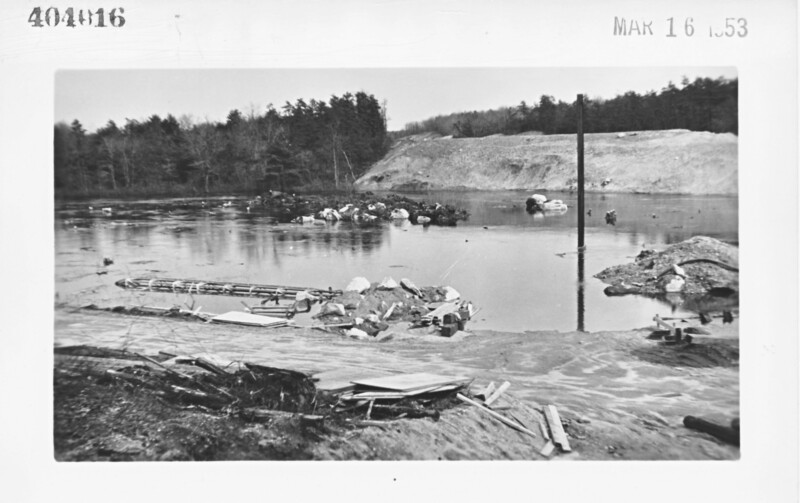 The tremendous amount of material that had to go into the Chester’s Dam area. Without it Exit #1’s southbound cloverleaf ramps would have been hanging in space. 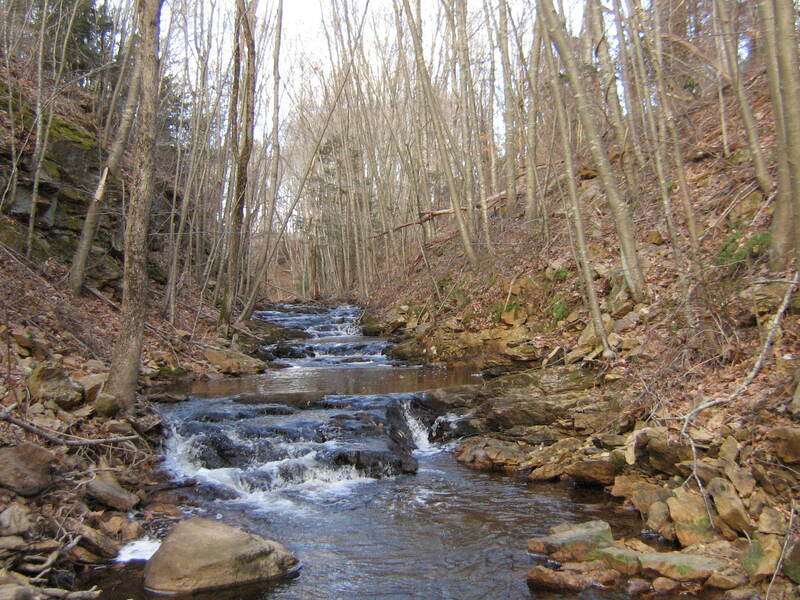 Palmeter’s Brook, once impounded by Chester’s dam, has been relocated and straightened. All the buildings of the “Town Farm” are gone. However, stone walls stand to show us its old pastures and fields. The park & ride has yet to be built and the fill that now covers burial lot #80 has yet to be trucked in. 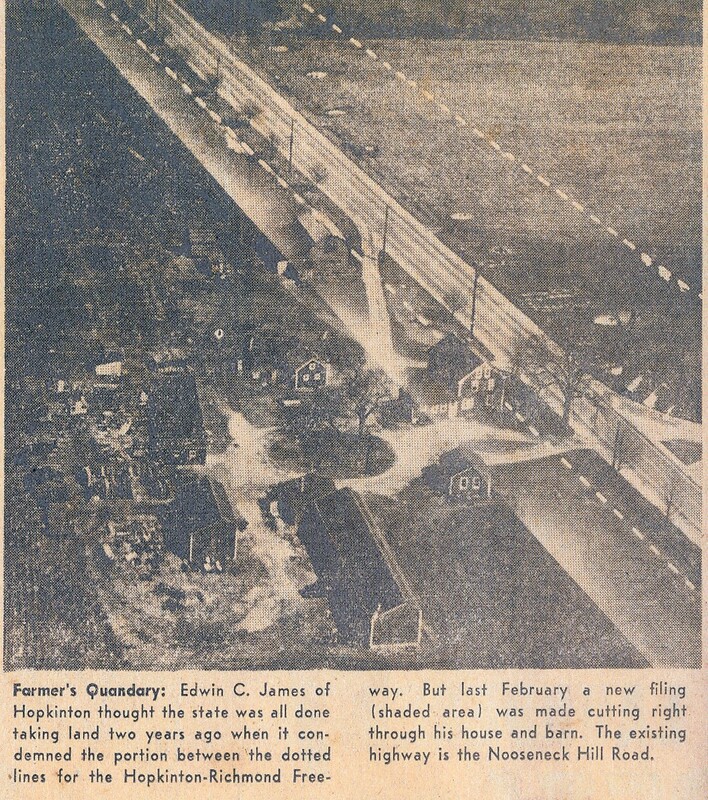 The construction of 95 presented the James family with a number of problems. In 1954 they learned that they may lose their home and their livelihood. Their home was condemned and the new highway would cut off access to parts of their farm that grew grain for their chickens and provided their flock free range in the summer. The highway would also limit access for their many retail customers. The series of pictures that follow tells their story. This house stood just north of the RI/CT border, in front of where the Rhode Island Harvesting Co. is located today. 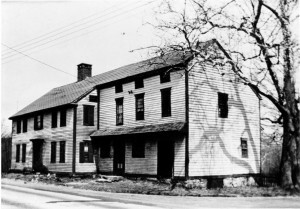 It was built in the mid-1700’s and was home to Edwin & Donna, their 3 sons, Edwin’s parents, and Donna’s mother. The old turnpike passed very close to the front door. Ed Jr., Charlie and Bob worked on the farm. 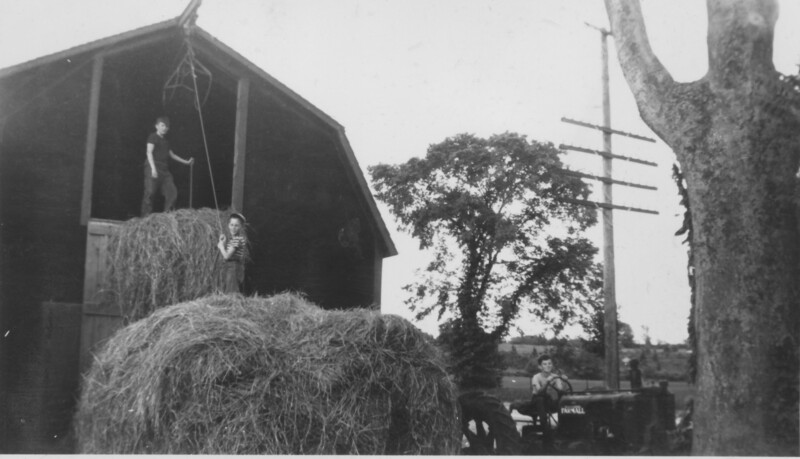 Here they are off-loading hay into the old barn, where their grandfather James still kept a few cows. The turnpike comes very close to the barn and can be seen directly behind Charlie and the tractor. 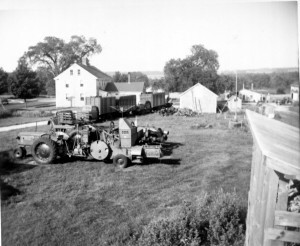 The fields across the turnpike were essential to the farm. Some years they provided free range for poultry in the summer. Other years they grew grains for winter feed. Here young Ed and Bob pose with their puppy in front of the main buildings of their dad’s poultry business. The single story building closest to them houses an incubator room, a sales room, a processing plant and a large army surplus generator to keep things going if power failed. From live chickens to dressed birds ready for sale was pretty much a one man operation. Business was good and the family did well. The Quandary: Where and How to Make a Living? 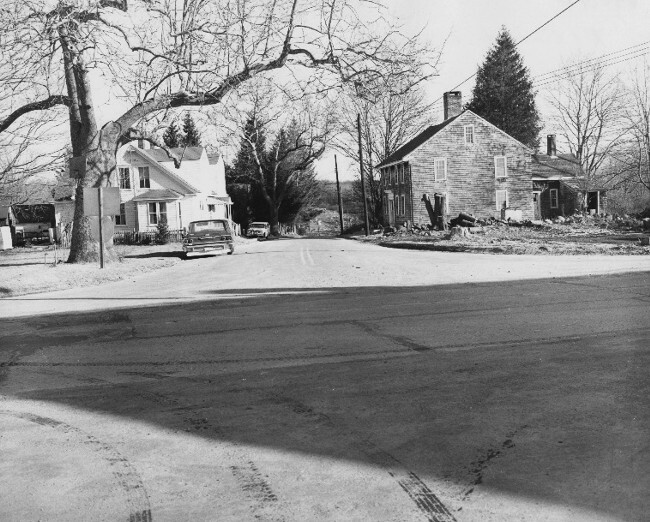 This caption from February 1954 tells the story, but (leave it to the Pro Jo) it got the name of the road in front of the house wrong. Rte. 3 was called Nooseneck Hill Rd. by out of town folks. Locals knew the section through Hopkinton by its original name, the New London Turnpike. 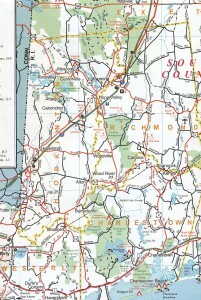 The section from the state line to the “Triangle” intersection was actually designated on maps as RI Rte. 84, like its Connecticut counterpart. 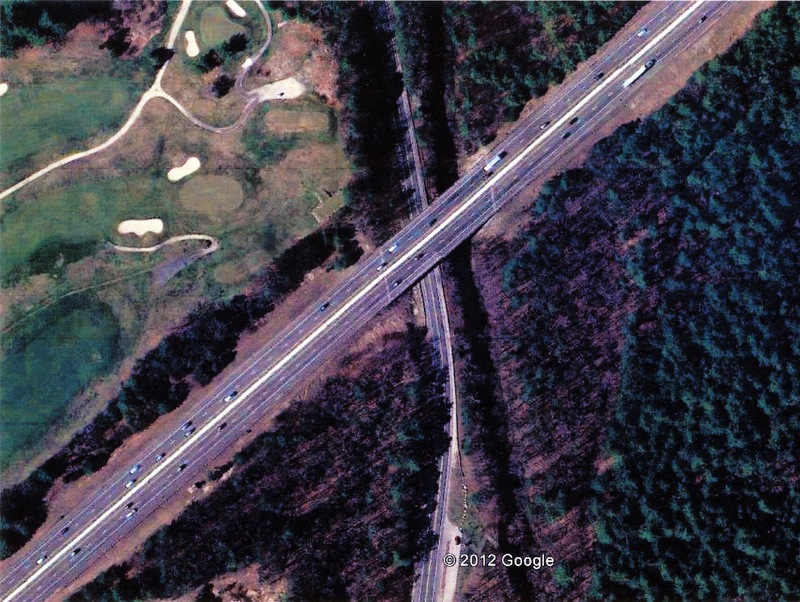 Today a little section of the old highway still exists next to I-95. It provides access to the Rhode Island Harvesting Co. and the old Cole farm on the hill above. 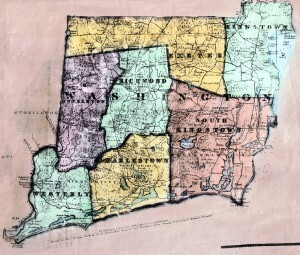 On maps it is designated the 184 extension; again using the number of its Connecticut counterpart. Luckily a solution was close at hand. 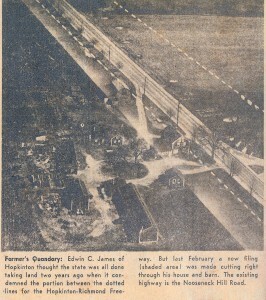 This 1952 photo of the James’s back farm yard shows the extent of Edwin’s poultry business. 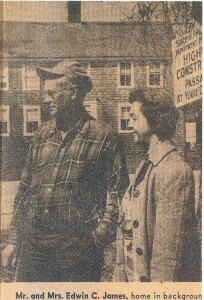 It also shows the beginnings of The Rhode Island Harvesting Co. Their son, Charlie, had started this business in 1950. At 19 years old, he and a couple of teen aged friends began harvesting crops for area farmers. This business didn’t require his dad’s fields and in time it prospered. Faced with the loss of his home and livelihood, Edwin James legally challenged the state for just compensation – and won. This enabled him to afford to move the house to the new site. A true Swamp Yankee, he prepared the site for the move himself, using his own equipment. 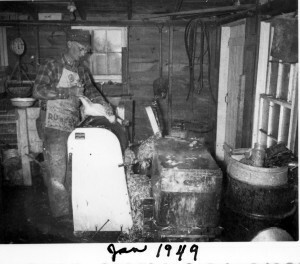 Notice – Chickens are still part of the everyday routine on the farm. Notice – The curtains are in the windows while the house was moved. 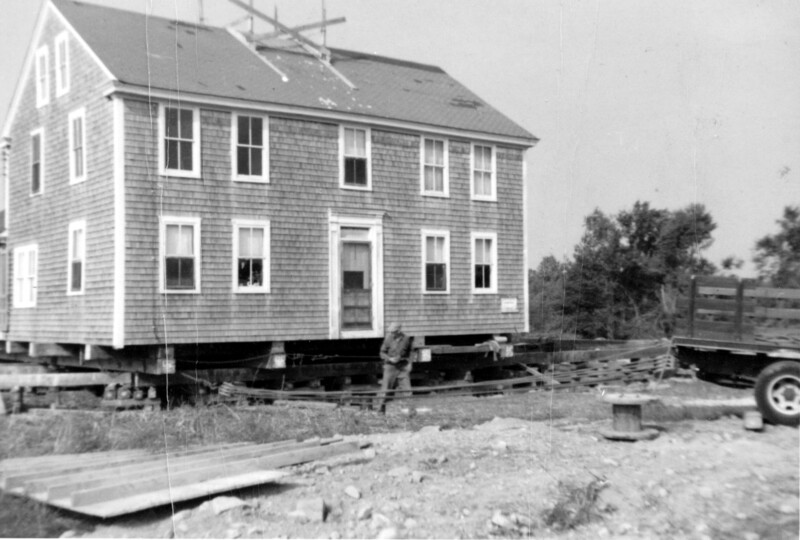 The James house was moved with all its furniture in place. 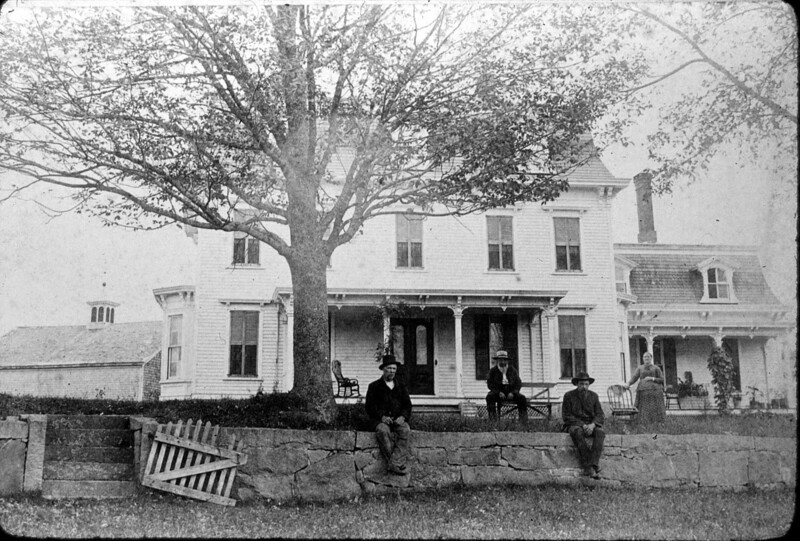 In fact the family lived in the house even as it moved the 150 or so yards to its new location. Word passed down as family lore tells us that not one dish or glass was broken in the move. Notice – The house has settled on to its new foundation. Soon Edwin’s father’s old dairy barn will be relocated as well. 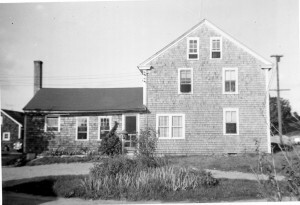 In its new location the old barn became the center of The RI Harvesting Co. Soon after 95 opened, Charlie James’s business began to focus on the sales and service of farm and construction equipment. 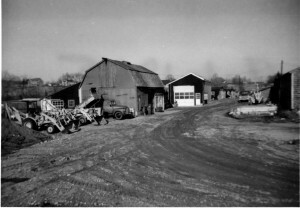 The barn became headquarters for parts and service. For many years thereafter his dad, Edwin, manned the parts counter. All the uncertainty faced by the family had been resolved with Yankee determination and ingenuity! 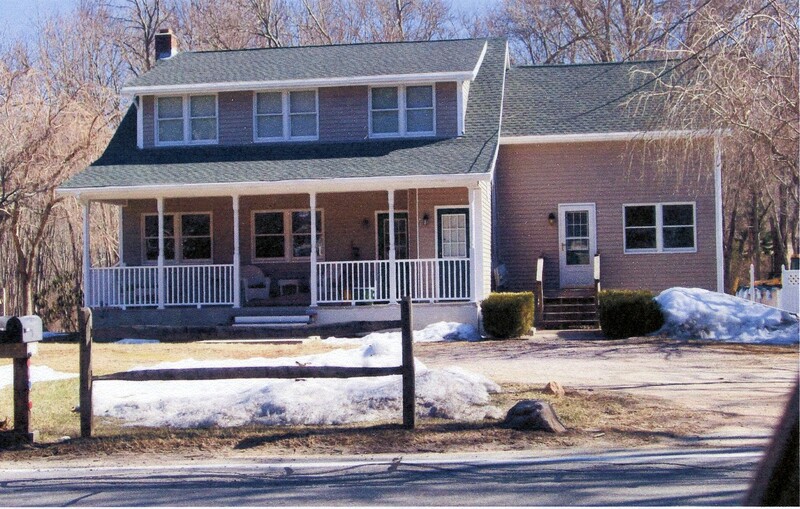 The farm house is in its new location and a light pole stand approximately where it had stood. What had been a place where harvesting equipment waited to move out in convoy to work far away fields is now a sales lot. The station wagon on RI-95 seems to be traveling pretty fast. However, in about a half a mile it will encounter a bottle neck as it enters Connecticut. 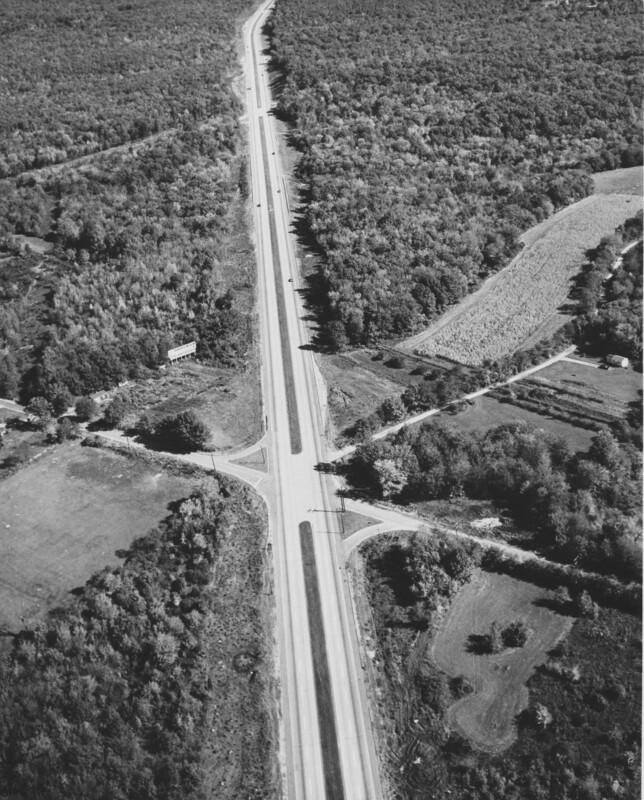 Through the 1950’s & 60’s Rhode Island built a modern 4 lane highway across the state. The first section of what was called RI Rt. 95 stretched from the state line, through Hopkinton and up to Baker Pines Road in Richmond. This picture was taken from a second story window of a chicken coop on the James farm. It captures people parked and waiting for the ribbon cutting ceremony. 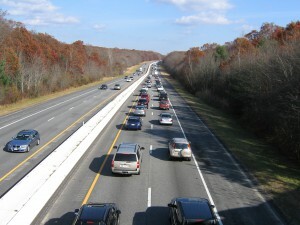 However, a decade would pass before Connecticut will complete its corresponding highway through that state. 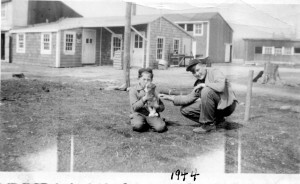 At the left is the chicken coop from which the 1955 ribbon cutting picture was taken. Below that sign are two KEEP RIGHT signs, warning traffic coming from Connecticut to move into the North bound lane of then RI-95 to avoid on-coming traffic! 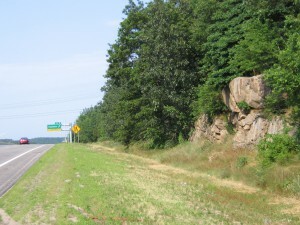 The large sign on the right warns of the intersection with Wellstown Bridge Rd. then still open for traffic. Wellstown Bridge Rd. and all secondary roads intersecting RI-95 directly crossed its 4 lanes! 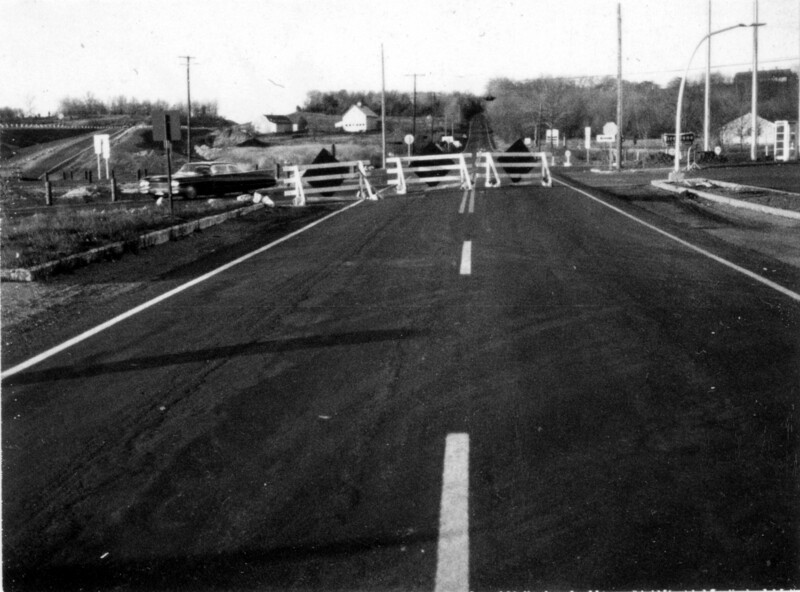 RI’s four lanes must narrow to two lanes to go over the New London Turnpike Bridge built in 1936 and onto CT-184. The number was changed from 84 to 184 because CT was working on their own highway designated as I-84 near Hartford. 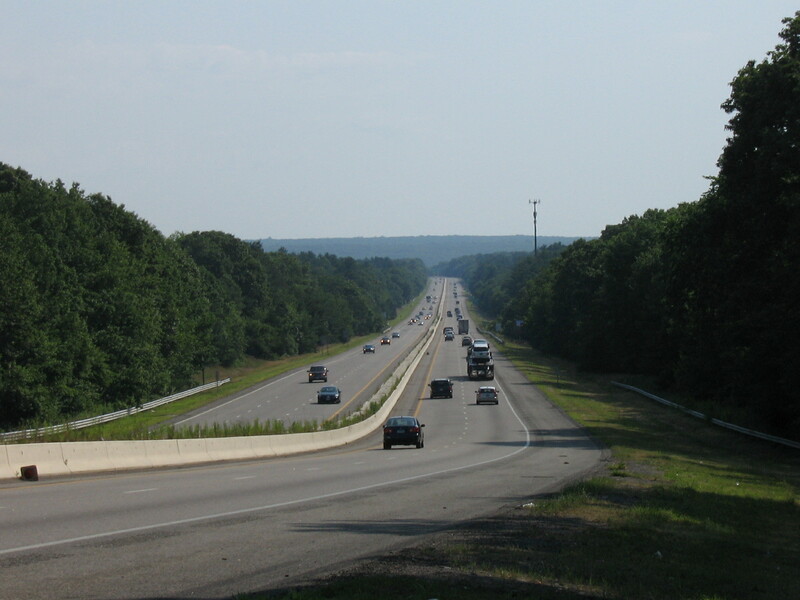 Clearing for the construction of the new four lane highway has been done in both RI and CT. The derrick in the center of the photo is setting a foundation for the two bridges that will carry north bound and south bound traffic over the little Green Falls River. All traffic at this point is funneled over the 2 lane bridge at the right built in 1936. The gravel drive leading from the to the derrick 2 lane road just before the bridge. 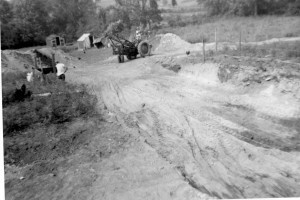 From the late 1930’s to the time of this construction the gravel drive led to the Ashawoag Picnic grove. 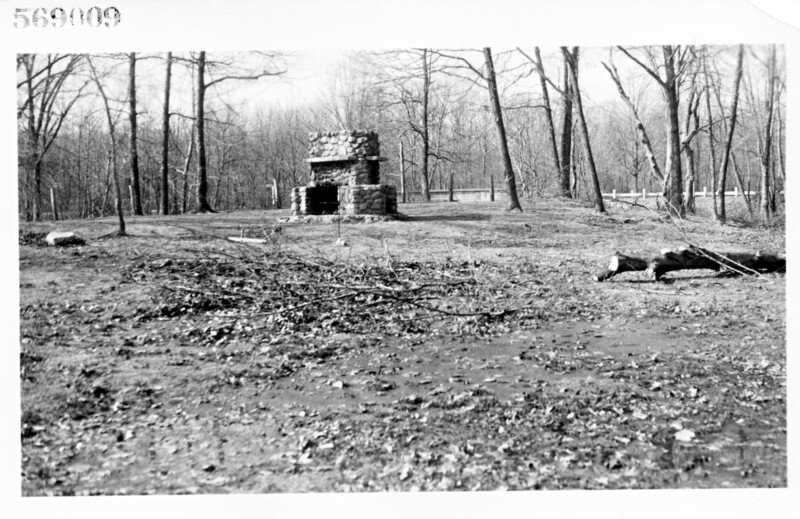 This little picnic area was built by the CCC about the same time as the two lane bridge – 1936. 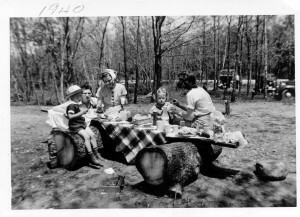 It was a rest stop along the highway, a place for families to picnic on a Sunday drive and venue for a number of church picnics for kids of Hopkinton, RI and North Stonington, CT. 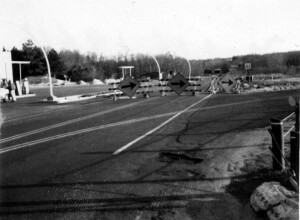 It remained open for several years after RI-95 was opened to traffic. However, Ashawoag Picnic grove was located at ground zero for the new bridges that Rhode Island was building as their part of relieving the bottle neck at the border. In 1963 the little picnic grove became part of the collateral cost of progress. Notice – The 2 lane New London Turnpike Bridge in the background. On the site of the Ashawoag Picnic grove two bridges have been built to carry traffic over the Green Fall River and into Connecticut. The project involved moving the river to allow it to flow under both lanes in a straight line, rather than at an angle. CT-184 is closed at Rte. 216 intersection. It has been redirected so traffic can access the new bridges of RI-95. 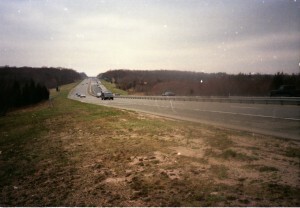 The car has been directed up what is now the southbound exit ramp at Connecticut Exit – 93 . Note – In 1965 Connecticut finally opened their section of 95 and interstate travel on 95 truly began. Federal regulation demanded that no road could directly cross a Federally designated “Interstate Highway”. Five secondary roads crossed Rhode Island’s Rte. – 95. 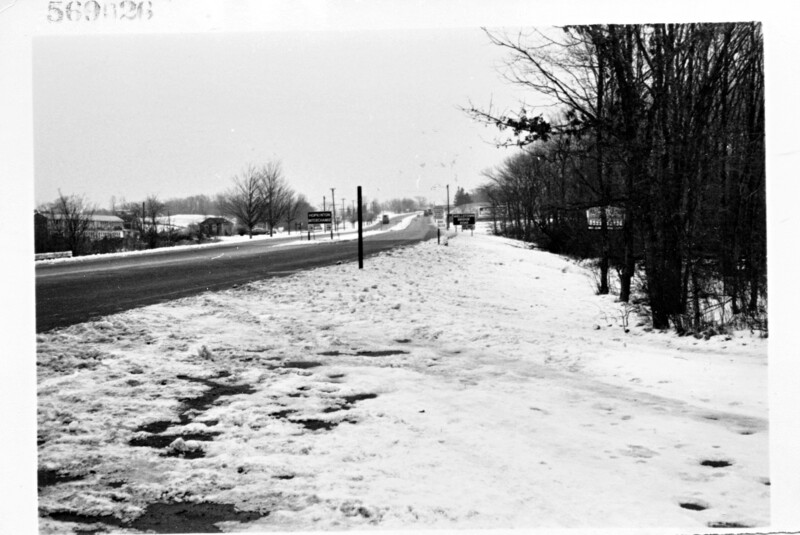 These were Wellstown Bridge Rd., Burdickville Rd., Woodville Rd., Canonchet Rd. 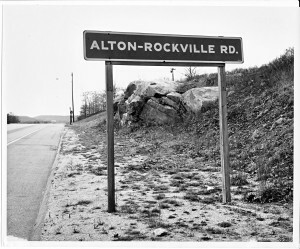 and Alton/Rockville Rd. A number of serious accidents resulted from this situation. 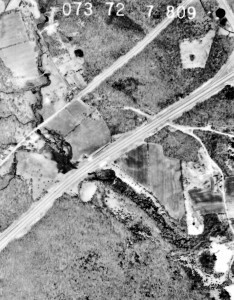 Notice – Burdickville and Woodville roads can be seen in this 1968 aerial photo. Traffic on the secondary roads was halted only by stop signs before it crossed the highway. Safety was then up to driver caution and LUCK! Burdickville Road is now dead ended as Town House and Maxon Hill roads. the power lines are strung directly over the highway, revealing that once the two separated roads were one. Bridging was the alternative chosen for Woodville Rd. It was a state maintained secondary road and a major route to Chariho Jr./Sr. High School. 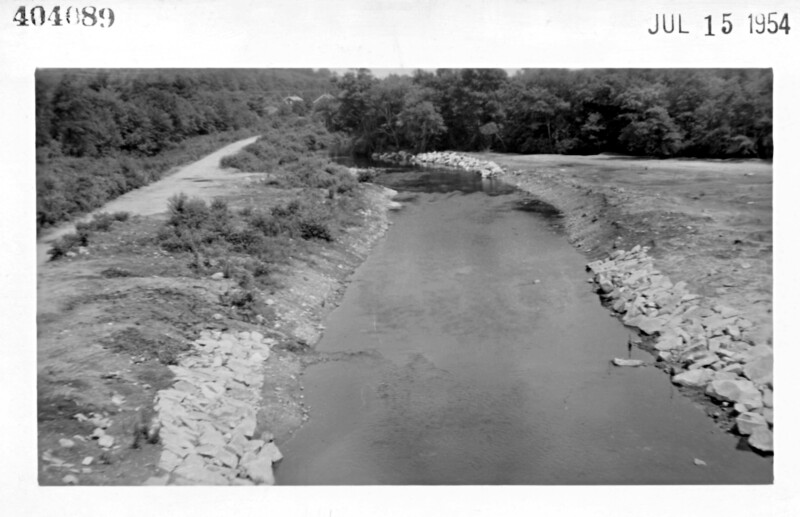 This photo shows the east abutment of the Woodville Rd. Overpass. during construction the temporary road beside the abutment was used. Hopkinton’s police station is now on the property on the left side of Woodville Road, just beyond this view. There would be some “collateral damage” as construction of the Woodville Rd. overpass proceeded! 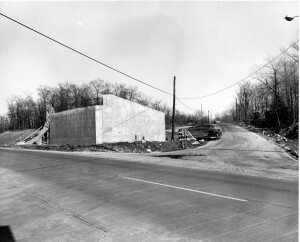 The west abutment for the Woodville Rd. overpass will be on the low side of the grade. This mound of fill is being added to is being an existing knoll to bring it up to level with the abutment on the east side. Notice – Originally Woodville curved around the knoll, where there was once an apple orchard. If you walk down below the ramp to the right today you can still find the old roadbed seen here. Fill for work on the overpass was taken from the property on the left. 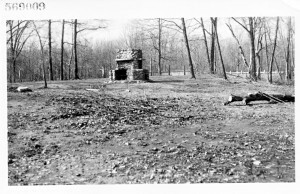 Hopkinton City’s cattle pound, built in the early 1800’s, was on this property and was lost to the construction. Federal standards required that Woodville Rd. be widened at either end of the new overpass. 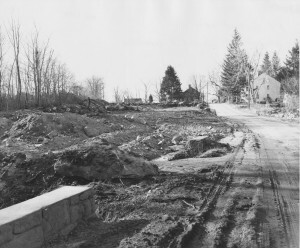 This resulted in the demolition of the house in the background on the right – the house where I had grown up. 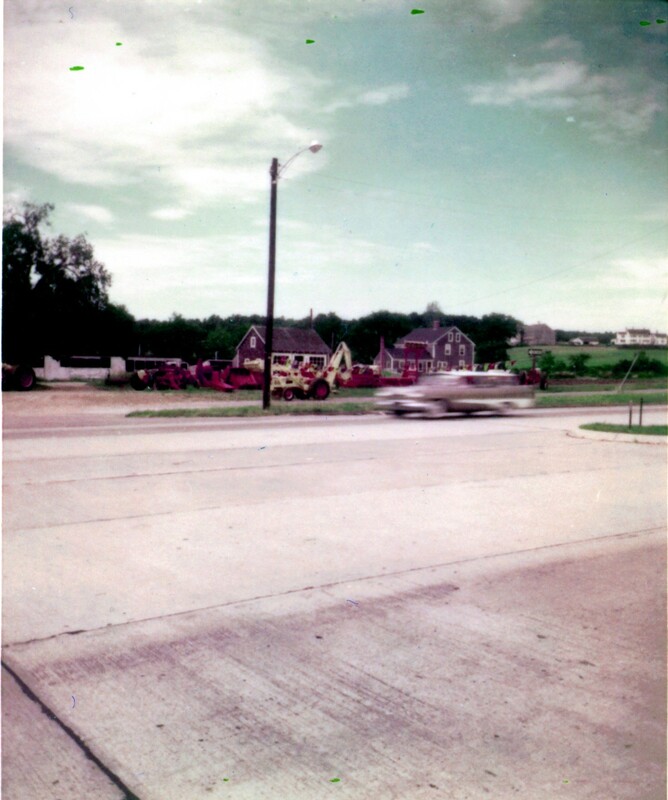 By July 1969 Woodville Rd. will be wider and straighter down to the new overpass. Also, the house on the right, built in 1789 by Henry Clarke, will have been demolished. Today the house in which I grew up is missing. Lost to progress. Yesterday’s loss is today’s safe passage over I-95. Today’s traffic would overwhelm old Route #3. There was another positive that that resulted from the negative impact of the construction on the village of Hopkinton City. 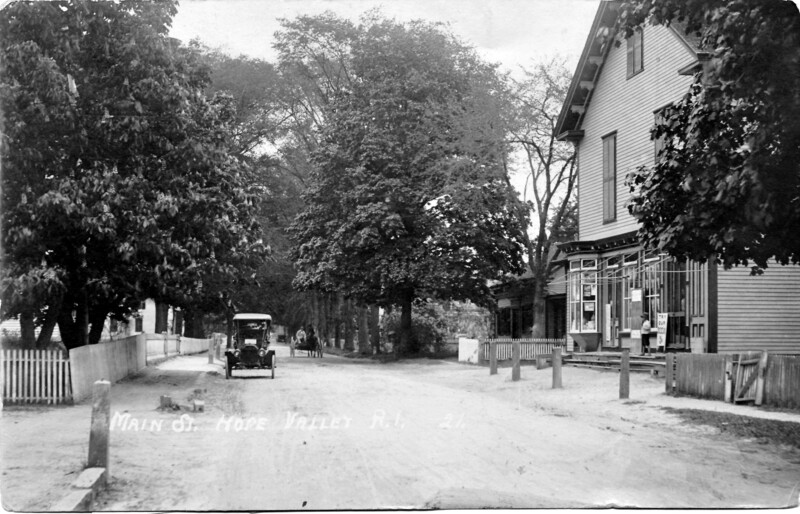 The people of Hopkinton backed a movement to designate Hopkinton City as a Historic District. This historic zoning status helps the town curb further erosion of the village’s historic character. Although drivers may catch a glimpse of a cow out of the corner of an eye, few approaching Exit #2 consider that they are driving through a farm. 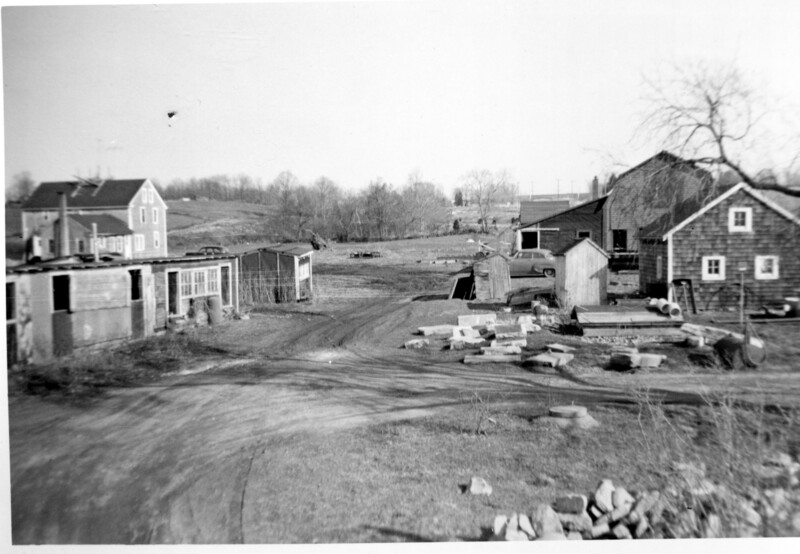 This photo shows us a view of the Reynolds farmyard that would have only been seen by the family working the land before 95 was built. 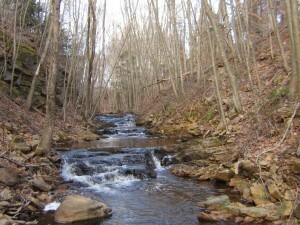 The stream that runs across the farm is Canonchet Brook. Notice – The Reynolds farm yard on Rte. 3 in the upper left corner. In 1953 the family and their cows still had complete access to their farm. The structure in the center of the photo is the beginning of a division. It will become the bridge that carries I-95 over Canonchet Brook. At the right edge of the photo are the ruins of an old barn and silos that had burned years before. 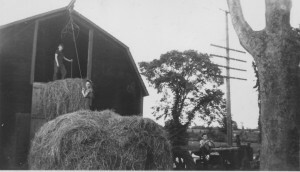 A small hay barn is also standing there. This small barn sill stands beside I-95 today. It now displays a URE Outfitters’ sign! The bridge carrying 95 over Canonchet Brook was supposed to provide a passage for the Reynolds cattle to pasture on the other side. It never worked. 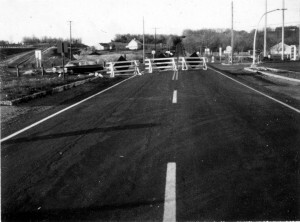 After RI – 95 opened in 1955 the Reynolds family only had access to their fields at the other side by crossing 95 at Canonchet Rd. It was dangerous but work had to be done. 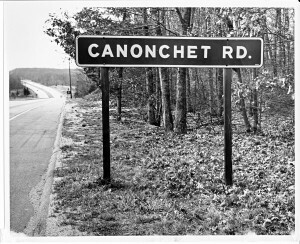 The Canonchet Road sign on RI – 95 and the stop sign seen next to the light pole in the background. 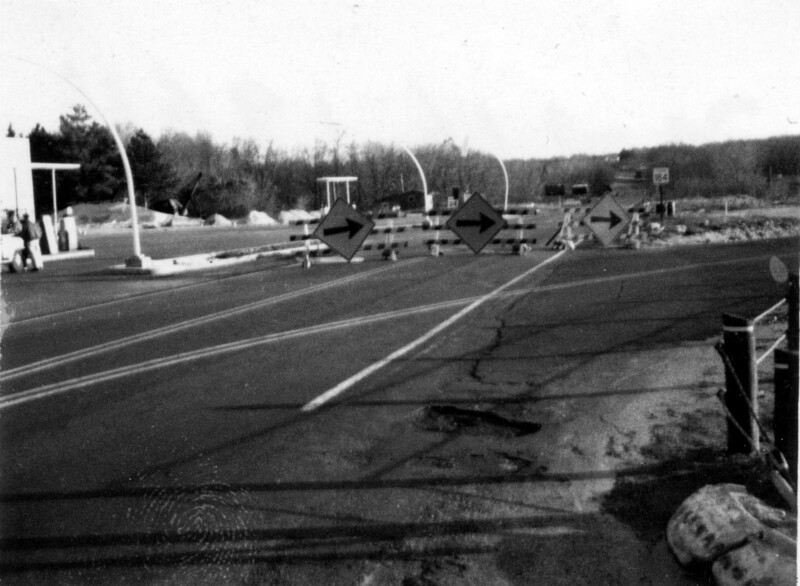 These were the only “safety measures” when secondary road traffic crossed the highway before limited access was imposed. There was little buffer between the road’s shoulder and the woods. Don’t fall asleep at the wheel! Notice – In upper right of the photo Exit #2’s ramps can be seen. Also, Interstate – 95 has a much wider buffer beyond the shoulder than RI-95. 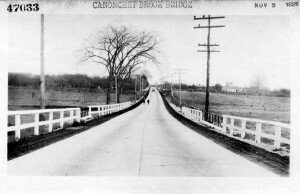 Canonchet Rd. has been dead ended as Reynolds Lane and Palmer Circle. The Reynolds family now must drive their equipment up Exit #2 and follow Woodville/Alton Rd. to Palmer Circle. Their fields are behind the golf course, a trip of nearly 2 miles one way. Looking west at the farm from 95 today you may see cows at work – the only place along I-95 in Rhode Island you can see this sight! Looking east you can still see the abandoned barn, the only remaining structure from the ruined farmstead that was once there. It’s there, but inaccessible to the Reynolds family. 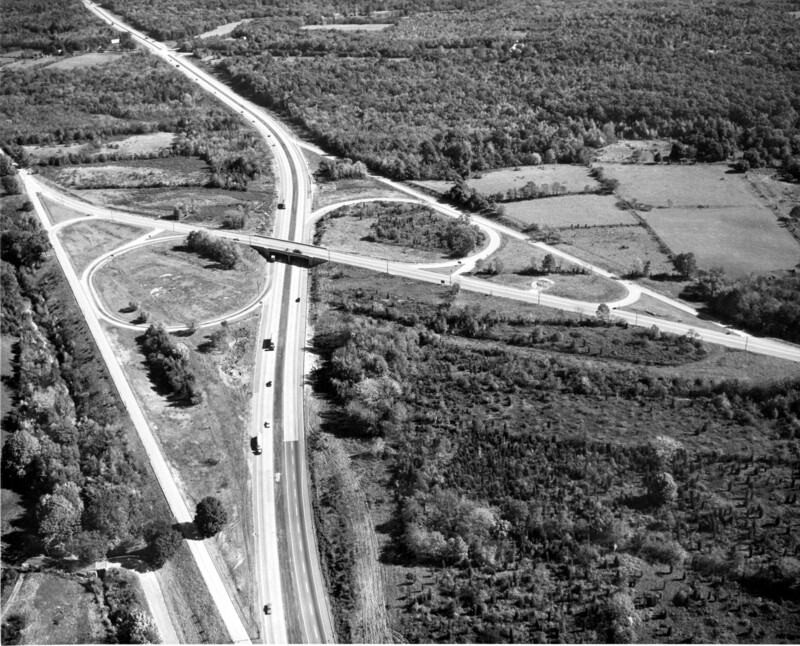 Bringing RI-95 up to federal standards resulted in the construction Exit #2. 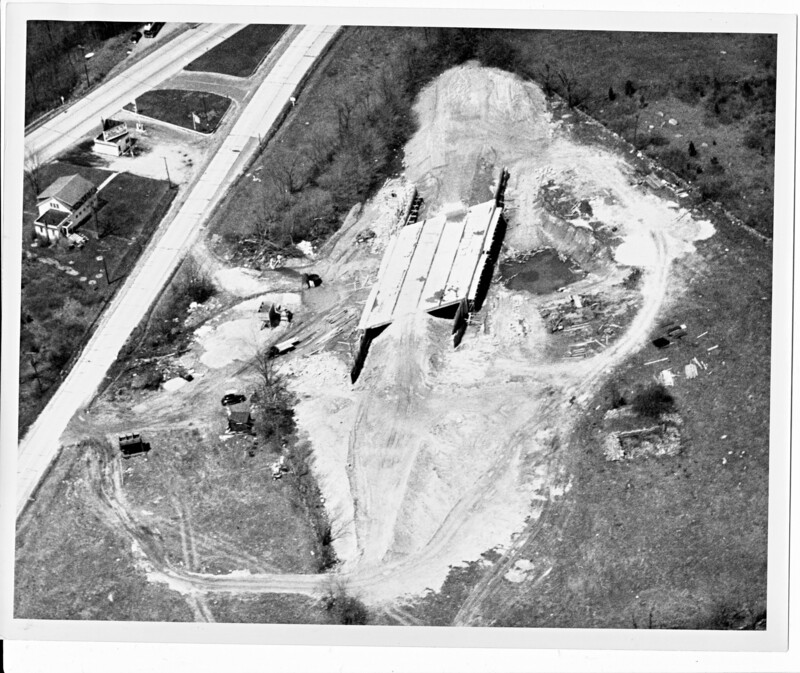 The overpass and the creation of Woodville/ Alton Rd. 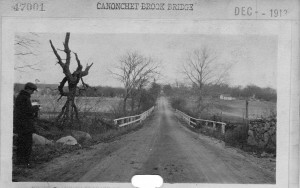 made both Canonchet Rd. and Alton/Rockville Rd. Obsolete. Part of upgrading the highway was the creation of wider safety buffers. The distance between the rock ledge and the travel lane. Again: Don’t fall asleep at the wheel! Staying alert is staying alive, but if you do doze here you may survive. 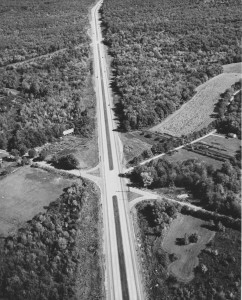 Note -In 1969/70 the shoulders and safety buffers were widened along the entire 10 mile length of RI- 95. The project generated thousands of tons of debris. Note: Recall Pic #20 taken in 1968? 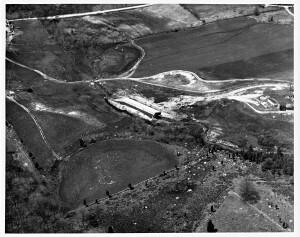 It showed that the pasture & hay fields on land that was once part of Hopkinton’s Town Farm near Exit #1 were open and free of debris. 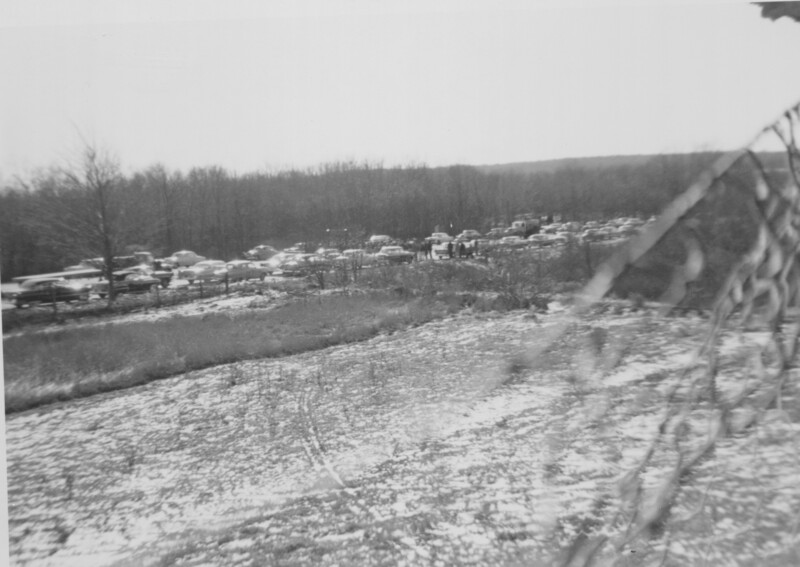 The upper left corner of photo #60, taken in 1972, shows that a large portion of those meadows are now covered. The debris field stretches from I- 95’s south bound lanes almost to Rte. #3. It is made up of gravel, boulders and even large slabs of concrete. 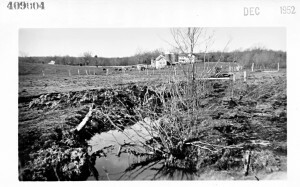 At the time it was being dumped, Edwin James said the debris was covering the Town Farm’s burial lot, Hopkinton Historical Cemetery #80. 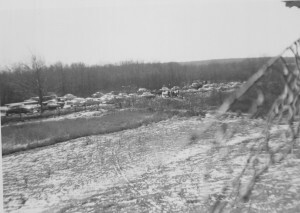 He indicated that graves were in the corner of the field behind where the farm’s cow barn had stood. Three corners of those fields appear to be buried. Under one of them rest dozens of deceased poor farm residents. This could present a problem for future development, such as the truck stop once proposed for this site. This section of I-95 passes through what once was a dairy farm owned by Clarence Wheeler. 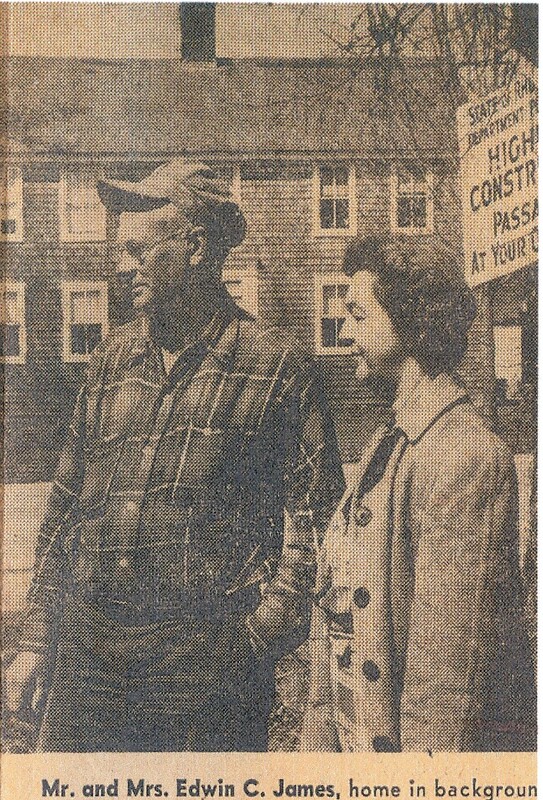 He lost over 25 acres, more than any one land owner in the town of Hopkinton. He was fortunate, however, much of what he lost was woods, not cropland. 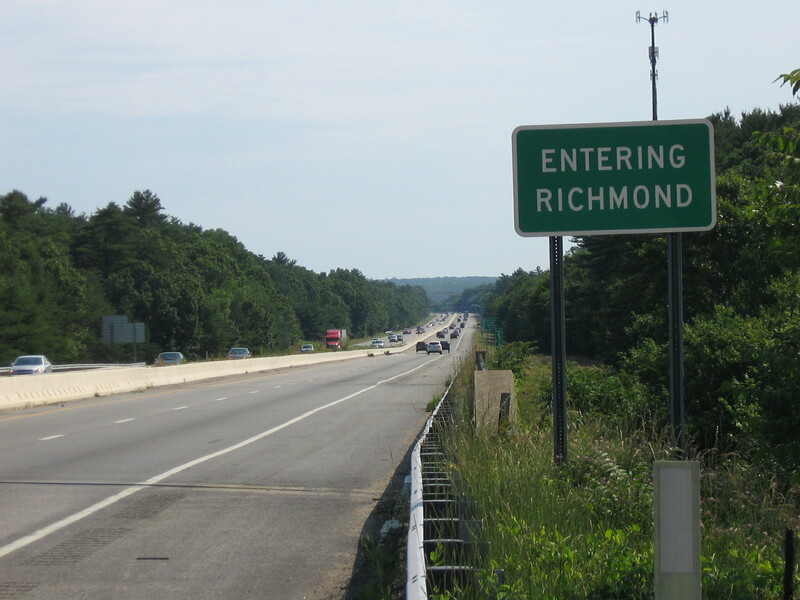 The section of highway that crosses through the Wheeler farm and then over Wood River into Richmond is the longest straight stretch of Interstate-95 in Rhode Island. 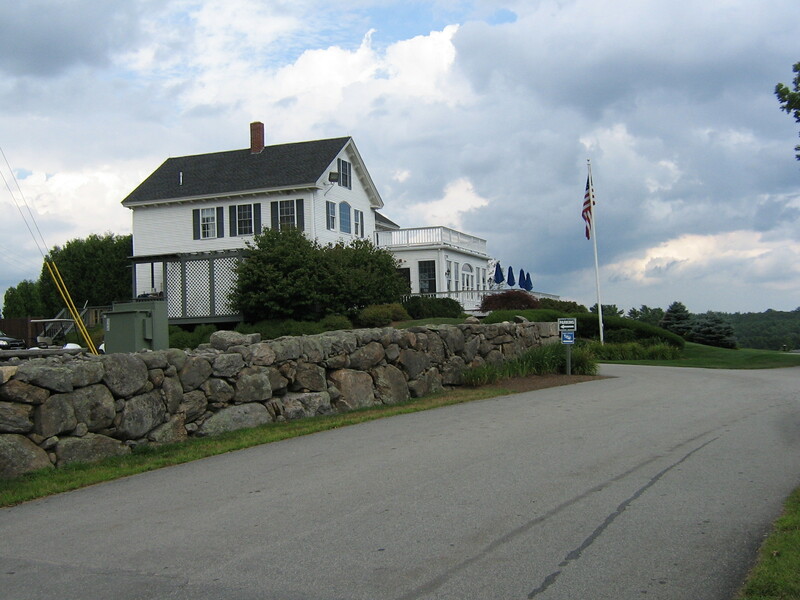 Clarence Wheeler’s dairy farm is now home to Fenner Hill Golf Course. 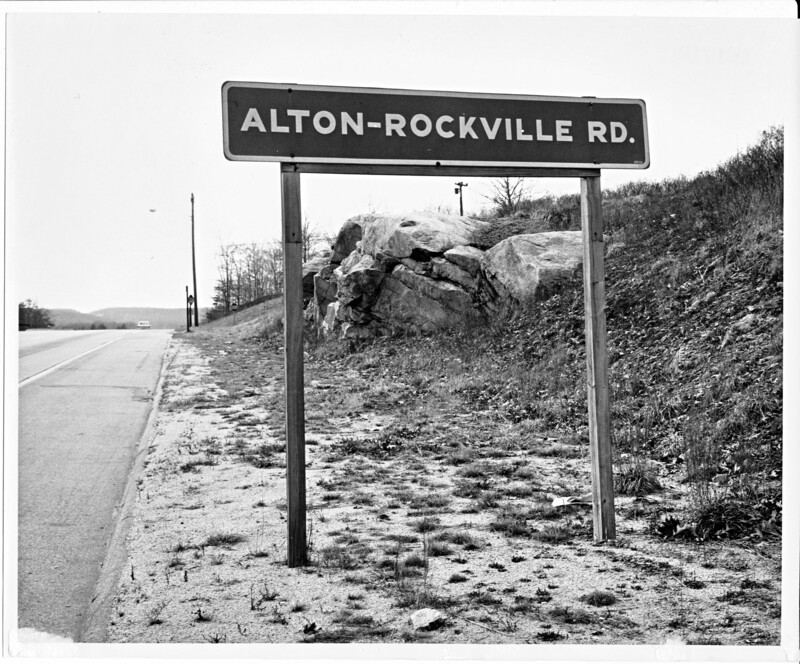 Before they were dead ended Alton/Rockville & Switch Roads gave access to this long straight section of highway. Rumor has it that youths from far and wide made use of it as a Drag Strip! Quarter mile start and finish lines were painted on the surface of the highway. Embankments provided bleachers for the cheering crowds. The town line signs at either ends to the bridge served as finish lines. Of course local and State Police took a dim view of the proceedings and put a stop to it, when they finally caught on. 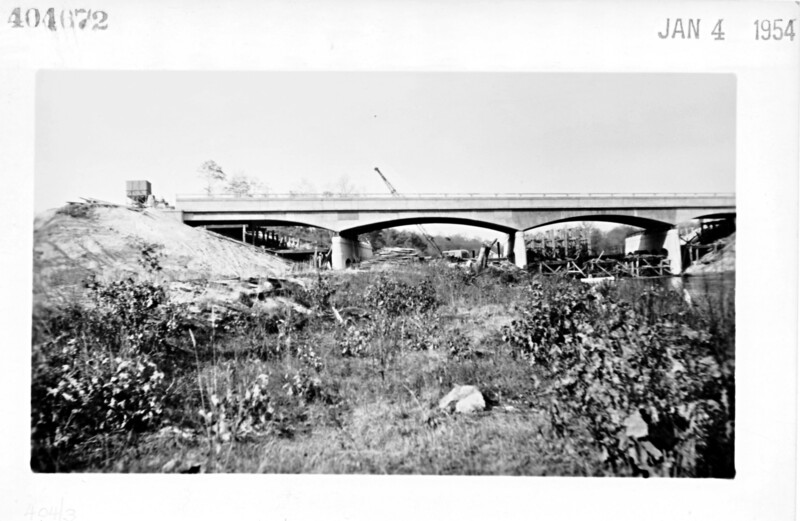 Before the Wood River Bridge could become a finish line … it had to be built! 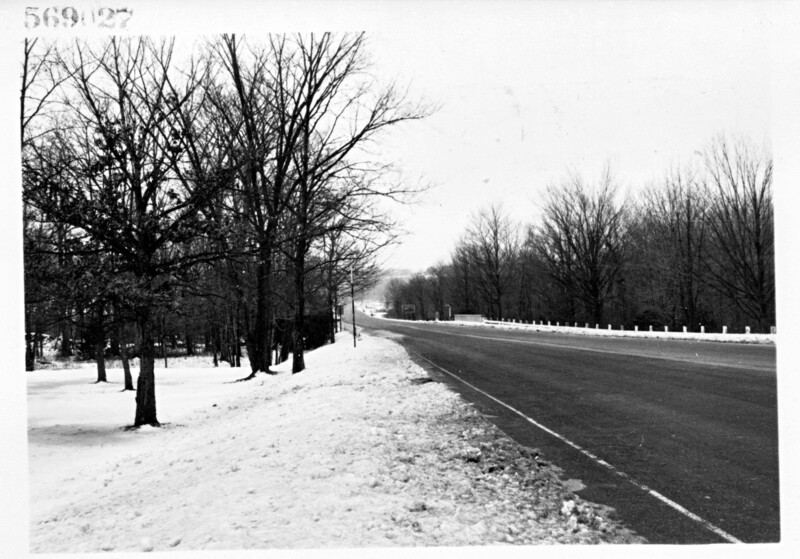 This 1952 photo shows where it will be located. 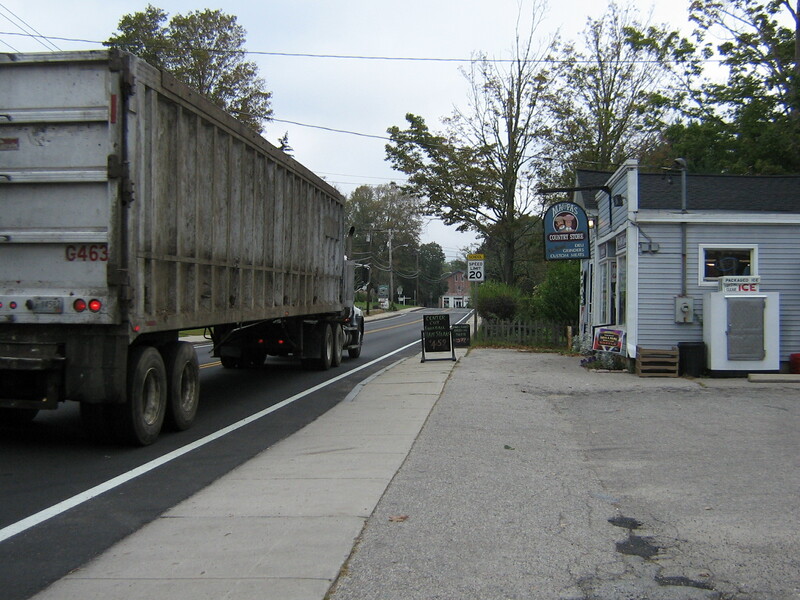 (Some say) the hill to the left of the truck will one day be bleachers for drag race fans. The rotten timbers in the foreground are the abandoned roadbed of Wood River Branch Rail Road. It will become an extension of Mechanic St. and connect to Switch Road, when a section of that road is closed. A long way to go before the races can begin. Wood River is quite high in this photo and the water is not sure where it is supposed to flow. A vast amount of fill has been trucked in on to the Richmond side of the river. That fill blocks an “ox bow” that was the natural course of the river. A new channel has been dug. However, it has not yet been finished to the point where it can accommodate the river in flood. Notice – The new channel now is lined with stonework. Now the water is contained and flowing smoothly. This photo shows that the span is complete, if not yet ready for a race. 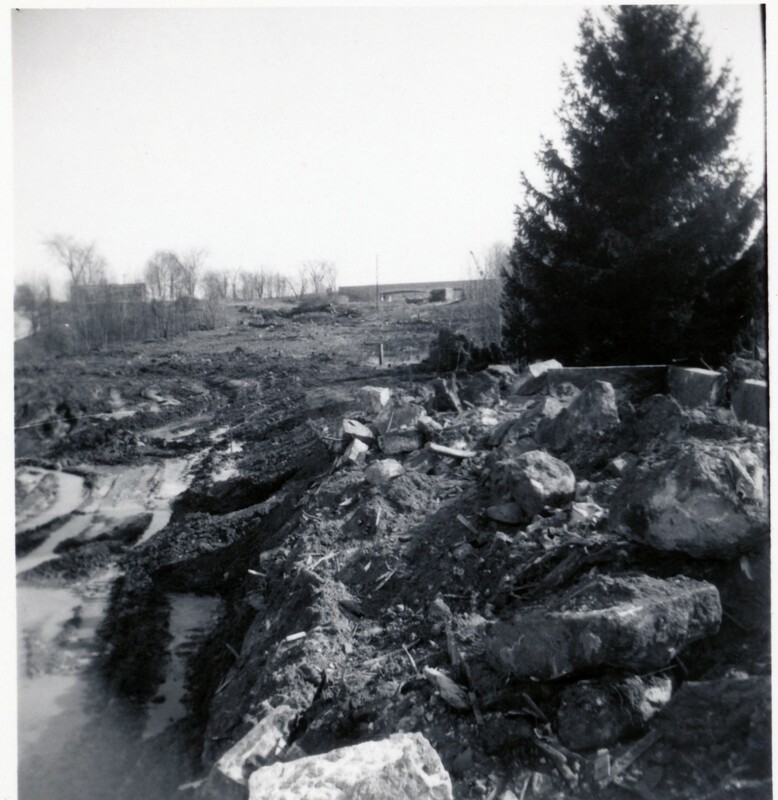 Notice – This photo is taken from the old railroad bed as was SLIDE #64 in December of 1952. The “ox bow”, the curve that made it necessary to redirect the river. The old railroad bed going from top to bottom of the photo. This will become the extension of Mechanic Street and connect to Switch Rd. in Richmond. RI-95, eventually I-95, will cross from left to right of the photo from Hopkinton into Richmond. The plowed ground in the upper left of the photo is on “Spring Valley Farm”, the farm owned by Clarence Wheeler. Wood River flows in a straight line under Interstate-95. The railroad bed has become an extension of Mechanic St. to Switch Rd. “Spring Valley Farm” is now Fenner Hill Golf Course. Note – Be careful when driving on I-95 in this area. 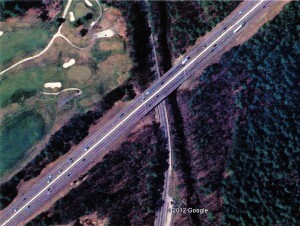 I found several golf balls along the northbound lane as I was taking pictures along the highway!